When you hear the word "abuse", more often than not, you think of a physical act. We forget that abuse can mean more than just a slap or a punch. Emotional and psychological abuse are, in many ways, harder to recognize because they don't leave visible scars. This type of abuse can be as seemingly harmless, and sometimes even endearing, as telling you what clothes to wear (or not wear) to something more drastic like isolating you from everyone else in your life so you become dependent on your partner. 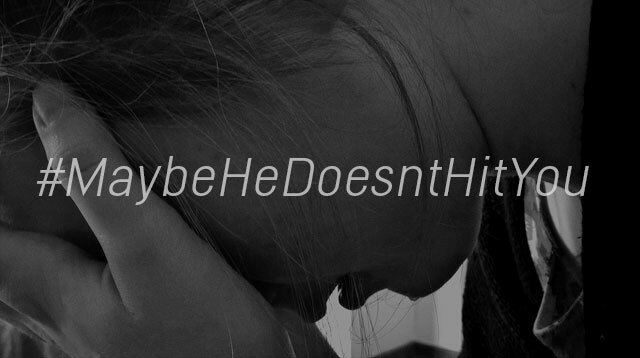 According to the National Coalition Against Domestic Violence, "lack of physical violence does not mean the abuser is any less dangerous to the victim, nor does it mean the victim is any less trapped by the abuse." #MaybeHeDoesntHitYou but he uses religion and his own patriarchal interpretation of the Bible to control you & take away your authority. #MaybeHeDoesntHitYou but he holds every mistake against you, makes you feel dumb for forgetting things, and silences your opinion. Have you ever been a victim of emotional abuse? Sound off by commenting below.